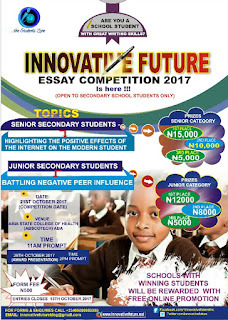 Innovative Future is delighted to announce the successful completion of the writing phase of the maiden edition of Innovative Future Essay Writing Competition 2017. 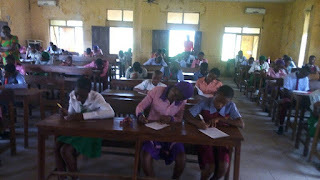 The writing competition which took place at Abia State College of Health and Sciences Aba, Abia State was attended by 60 secondary school students spread across 13 different schools in the Aba region. 33 Senior Secondary School Students and 27 Junior Secondary School Students were writing! Writing commenced at 12:05 pm with all entrants on sit and was concluded at the expiration of an hour (1:05 pm). Students were served light refreshment shortly after the exercise which was conducted in a tranquil atmosphere. Entrants, parents, prospective sponsors and school teachers are by this notice invited to promptly attend the award presentation ceremony billed for Saturday 28th October 2017 at the same venue. Cash prizes will be handed out to the best three students from each category at this year’s gala! It is really interesting post. You talk about Essay Writing Competition 2017 . I have read this post very carefully.I need cheap custom essay writing. I think, You can help me. This competition is really very good option for the students and they can improve their knowledge and writing skill and various topics. Like statement of purpose engineering is most important one topics. 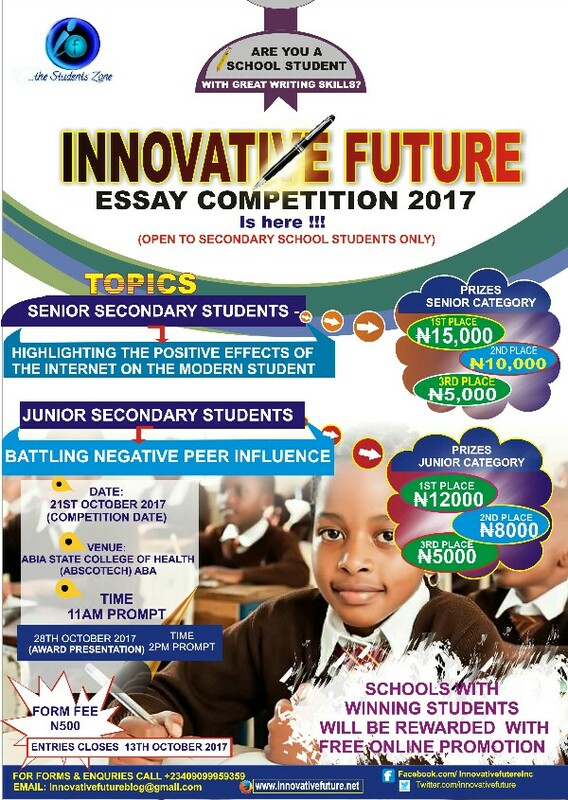 Innovative future essay writing competition is a good task, in which all the students can improve their writing skills. To write a good cv pharmacy, we should learn writing skills.